In 1454, in the Rhineland town of Mainz, three friends formed a legal arrangement to produce an epochal object. 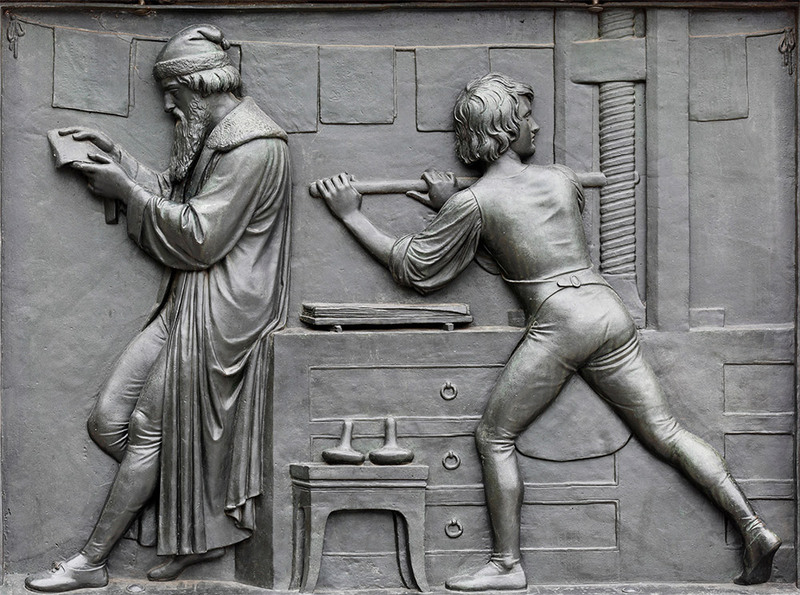 An inventor, Johannes Gutenberg, a printer, Peter Schöffer, and a financier, Johann Fūrst, collaborated to publish a Bible – the Gutenberg, as it is now known – widely regarded as a transformative moment in the history of European culture. Before that, although there had been innovations in the production of handwritten (scribal) editions of scripture – including what were regarded by many as heretical attempts by the proto-Protestant Wycliffe to produce vernacular editions of the Bible – these only had limited audiences. Manuscript copies were expensive and limited to elite, bespoke consumption, usually for monastic and scholarly usage. The first printed Old and New Testaments, reproduced in this new Taschen facsimile edition in two folio volumes, marked a cultural turning point, which was to shape religious controversies and political crises and conflicts throughout the following centuries. The production was technically complex and required an extraordinary amount of careful labour, which included setting 42 lines of text per page, consuming 2,500 bits of type, drawn from a font of 300 distinctive pieces. As the modern edition establishes, this was a big book, running to nearly 1,300 pages and weighing around 66lbs or 30 kilos. Often, as evidenced in the Eton copy of the work, which I have examined, the binding itself, with metal clasps and embossed corner protections, added to the sheer weight of the book. Some 180 copies were produced, of which 49 exist today, all carefully listed by Stephan Füssel in the introduction. It is no exaggeration to say that this innovative production created an object of authority; but it also encouraged dissent. The result of a timely collaboration between technology, finance and skill, the Gutenberg Bible was a triumph of technical organisation, which lay the foundations for what has been called, in Marshall McLuhan’s phrase, the ‘Gutenberg Revolution’. It heralded a step change in printing technique: whereas earlier forms of printing relied on woodblock technology, the use of moveable metal type allowed more flexible, efficient and cheap printing. The invention of new forms of ink (more like a veneer) enabled crisper and more durable printing. The initial ambition of typographical design aimed at replicating the look of the commonplace manuscript format, in columnar form, with a good balance between white space and the printed blocks. Printing also enabled accurate, and (mostly) reliable reproduction across a number of volumes. It also meant that any minor mistakes would be reproduced, too. The printer who mistakenly omitted a vital ‘not’ from the Ten Commandments was vigorously punished by a very bad-tempered Archbishop Laud in 1631. The crisis of Reformation authority encouraged the printing of Bibles in Germany, England and, eventually, Geneva. Luther and Tyndale led the way with their clandestine and vernacular Bibles. For Luther, the emphasis of salvation upon sola fides (faith alone) could only be established by studying God’s word (sola scriptura). The printed Bible in the hands of the public posed a fundamental challenge to papal dominion. Once released from Latin into the vernacular, the word of God became a weapon. Cheap Bibles meant more readers and, ultimately, more debate over the meaning of God’s word. While the Gutenberg Bible was primarily for elite clerical usage, it opened the door to mass and untutored readings and interpretations. The ability to produce hundreds, if not tens of thousands, of copies made the Bible a commercial opportunity and a cultural revolution. By the 16th century, across Europe, but most notably in Protestant countries – England, Germany and the Netherlands – the publication of Bibles became a highly profitable monopoly. In England, patents were granted to a small number of specific printing houses, which protected their privileges with passion. Unlike the Gutenberg Bible, these were published in the vernacular. Each of them – from the Tyndale New Testament of 1526 (for which Tyndale was executed) to the King James Version of 1611 – captured and preserved God’s revelation in the English language, specifically aimed to provide a text ideally comprehensible to every English servant and maid. The Gutenberg Bible had been designed for liturgical usage in ecclesiastical settings, but later printed Bibles were increasingly designed for ever more sophisticated private or domestic readings. It is estimated that perhaps some three million Bibles, all of different types, were in circulation by the 1700s. Since the precise word of God was so important to the godly, printed Bibles assumed a powerful position in the cultural politics of Protestant states. This was why monarchs from Henry VIII onwards were keen to have their authority stamped on title pages: injunctions insisted copies of these Bibles were installed in all parish churches. The Catholic Church saw an opportunity in applying their textual erudition to claim that the written word of God might be fallible, without the supporting buttress of papal tradition. From the mid-16th century onwards a battle of Bibles was in full swing. The oppressed Protestants who fled the Marian persecutions produced a handbook of resistance in the form of the Geneva Bible of 1560. Replete with a full apparatus, especially an embedded marginal commentary, the godly were guided to a proper account of their duties as Christians. The Geneva Bible, itself a triumph of typological design, continued to be published into the late 17th century. James I and VI despised the ‘marginal notes that slight the text’ and encouraged the production of a ‘safe’ version, which instructed the laity to listen to their parish clergy rather than interpret revelation for themselves. Alongside the authorised Bibles grew an increasingly sophisticated and profitable market in ancillary works: concordances, commentaries and annotations, which aided the reader’s encounter with the words of God. English Bibles came complete with instructions on how, when and why specific chapters and verses ought to be read. The printed format (the introduction of page numbers, chapter and verse divisions) enabled even the less learned to make sense of scripture. With this literary technology, readers could exchange and share their views of specific passages. For those who could not read, domestic spirituality enabled collective understandings. Harnessing those encounters with the word of God enabled ministers, MPs and magistrates to justify their governments and rule. Oliver Cromwell ensured that his armies were sustained by a Souldier’s Pocket Bible (1642), legitimising their role in fighting ‘God’s Battles’. The legacy of the Gutenberg Bible was a revolution in the relationship between reading and authority in the early modern period. This encompassed the practices of lowly men like Nehemiah Wallington, who experienced their world through the providential lens of the Bible, or at the other extreme, scholars such as Isaac Newton and John Locke, who owned multiple copies for forensic textual comparison and exchanged commentaries on their findings. The rise of Biblical criticism encouraged scholarship throughout Europe, with the exchange of annotations and commentaries. From this emerged battles over faith concerning textual integrity (did we have all of the Bible? ), canon formation (when was scripture compiled?) and transmission (did early scribes copy an original or make mistakes?). The Enlightenment Bible aimed to defend a ‘reasonable’ Christianity, which was minimal in its doctrinal demands and supported toleration. Religious faith was the result of serious scriptural reading: conviction was gained through individual understanding rather than imposition by a clerical elite. Reading scripture, accompanied by the growing pile of commentaries, concordances and philological guides, allowed godly men to explore the message of God’s last words to direct their conduct. John Foxe had used the Book of Revelation as a narrative to unfold God’s purpose for godly and imperial British Protestantism; John Napier had found the numerology of the book so complex that he invented logarithm tables to cope with the calculations for determining end times. Thomas Venner, leader of the Fifth Monarchists, believed Christ had commanded him and his troops to strike down the Antichrist in Holborn in the 1660s. As Robert Iliffe has shown, Newton devoted millions of words to decoding the inner meaning of Revelation, but hid his own views from the Anglican establishment for fear of persecution. Justin Champion is Emeritus Professor of Early Modern Ideas at Royal Holloway and the 2018 recipient of the Historical Association’s Medlicott Medal for Services to History.